New Trends: Are Macarons the New Cupcakes? For the last few years, it seemed like every bakery in America had a neat display of cupcakes in their window. Cupcakes were served in lieu of wedding cakes. Guests could eat a cupcake instead of a full slice of cake and not feel guilty about it. Cupcakes were everyone’s favorite treat. But are they still America’s favorite confection? While cupcakes still remain popular, macarons–a French sandwich/cookie that is eye-catching and tasty have begun to rival the almighty cupcake. Macarons (not to be confused with macaroons, a baked coconut cookie) have recently began to pop up at events due to their size, taste and mobility. A macaron consists of two layers of a light-meringue made from almond, sugar and egg whites, and is traditionally filled with ganache, butter cream or jam. Traditional flavors include chocolate, strawberry, vanilla and pistachio. However, bakeries are beginning to become experiment with more unusual flavors of cupcakes. Some of the most unique concoctions have included green matcha, passion fruit and even bacon. 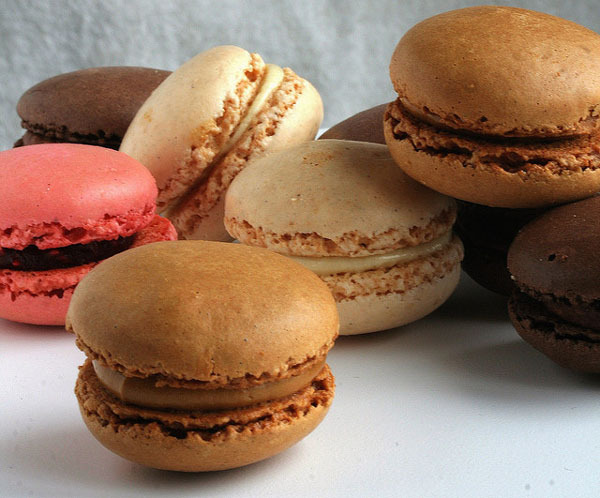 Karnaga has noticed a demand for macarons over the last four years. The macarons were originally not very popular–Karnaga and her staff had to push customers to try them. While macarons are on the rise, there is one tricky part about them: they are difficult to make. Unlike cupcakes, which can easily be made at home, macarons require a great deal of work and baking expertise to make. They are also more expensive than the average cupcake, due to the fact that their base is made from almond, not flour. While Karnaga does feel that cupcakes will continue to hold their own against macarons, she does admit that macarons may be a better choice as a dessert for parties. So are macarons the new cupcakes? According to Karnaga, it’s still too soon to tell. I love macarons. They are so petite and the variety of colors are wonderful! They are definitely trending right now. Another key aspect to this lovely dessert is that it is gluten-free, thus allowing a wider audience to indulge.